Many campers know that choosing the best gear for the trail is essential. Especially for your camp kitchen essentials, camping mugs may slip the mind as an item to bring, but they are an important part of your camping kitchen gear. After you’ve set up a campsite or hiked a long day, a hot beverage could hit the spot. 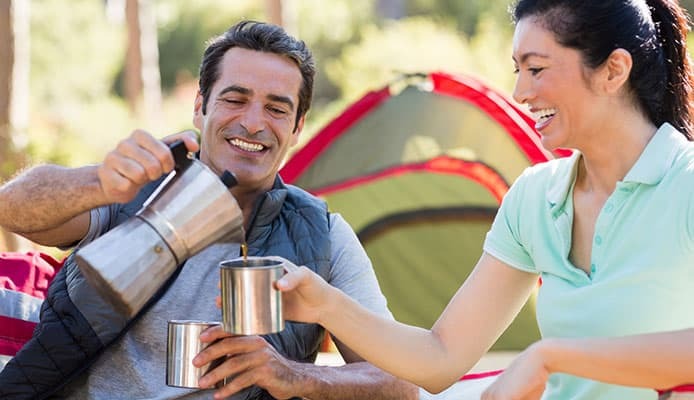 No matter what you choose to drink on your camping trip, a high-quality camping mug can enhance your experience and have you waking up to the smells of fresh camping coffee. There are many camping mug designs, but the best camping mug will be durable for rugged use, lightweight, and long-lasting. With the best camping mug, you’ll gain a valuable trail companion that always stays by your side. With our list of the 10 Best Camping Mugs in 2018, you can hit the trails and make your camping trip just a little bit sweeter. This top rated insulated camping mug is the toughest and over-engineered design on the market. 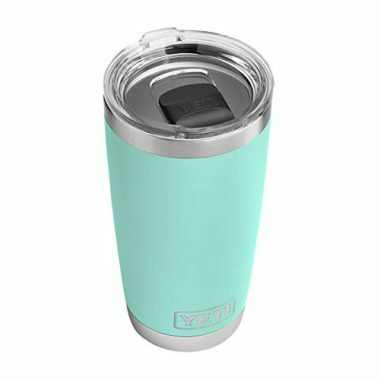 The Rambler Vacuum Insulated Mug by YETI is made of stainless-steel with a duracoat color. This means that the outside of this camping cup will not scratch, peel, or fade over time. This outdoor mug has a double wall vacuum insulation that keeps your drinks hot or cold until the last sip. This mug has a full loop, triple grip handle that is comfortable for even the widest hands. You can easily fit your hands around this stainless-steel camping mug to keep them warm. The Rambler also has a no sweat design, so you don’t have to worry about damp or frostbitten fingers. This camping mug deliver heavy-duty hydration in a durable and long-lasting design. 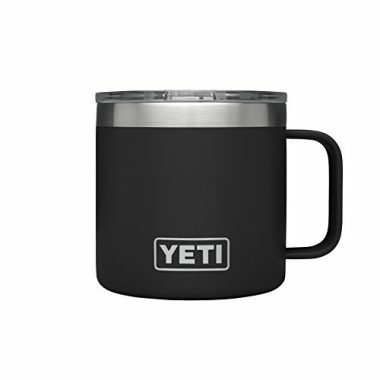 YETI ensures that their mug is rust-free and dishwasher safe. If you are looking for a larger size, this Rambler Vacuum Insulated Tumbler by YETI delivers 20 ounces of temperature control. This outdoor mug features a stainless-steel body with the duracoat design. The duracoat ensures that the color will not fade, peel, or crack. It also ensures that this camping cup has a no sweat design, is rust-proof, and dishwasher safe. YETI has also included in their design, their special MagSlider lid, which features the power of magnets to keep your drink on lock. This lid has a sliding plastic piece that is held open and closed by magnets and ensures that you drink maintains its temperature and can’t be spilled. With YETI you can start off strong and stay a while on your adventure. This tumbler is good to good, so you can keep your eyes on the destination. If you like the traditional grey color of stainless steel, this design by YETI ensures that you have a uniform style in a durable design. The Rambler Stainless Steel Vacuum Insulated Mug by YETI delivers 14 ounces of a tough and over-engineered camping mug. 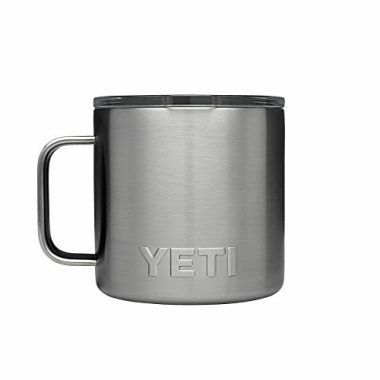 This outdoor mug is made of thick 18/8-gauge stainless steel, which helps resist dent and dings. There is a full loop, triple grip handle for comfort and ease. This top rated insulated camping mug has a double wall vacuum insulation that keep your drinks hot and cold for hours. The mug has a no sweat design, is rust-proof, and dishwasher safe. With YETI’s mug, you can stay hydrated and stay strong. This Insulated Stainless Steel Travel Tumbler by Hydro Flask is just the right size, offering 22 ounces of insulation innovation for your beverage. This travel mug is double wall vacuum insulated and features Hydro Flask’s TempShield Insulation, which maintains your beverages temperature for hours. A hot drink can stay piping hot for up to 6 hours and a cold drink can last for up to 24 hours. This travel mug features a sleeker and thinner design that fits comfortably in your hand or in a cup holder. This mug has a slip-free grip powder coat, that will ensure no sweat fathers on the outside of the tumbler. The tumbler is made of BPA free plastic and food grade stainless steel. It has the perfect press-in lid, which prevents drips and keeps your drink insulated thanks to the honeycomb insulation. Hydro Flasks ensures that they deliver high-performance, so you can enjoy your beverages on the go. This Classic One Hand Vacuum Mug by Stanley features a leak proof and fully packable design. 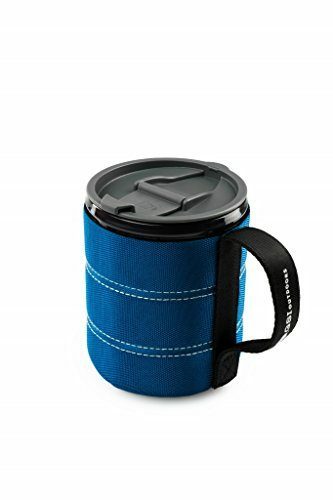 This outdoor mug is vacuum insulated and has a thermal lid to keep your drinks hot or cold for hours. You can easily open and close the lid with one hand because it has a push button design. This top rated insulated camping mug is made of 18/8 stainless steel that is rust proof. The lid is dishwasher safe and the mug disassembles for deep cleaning. This Infinity Backpacker Mug by GSI Outdoors is a lightweight design that has an insulated sleeve to keep beverages warm. This outdoor mug is made from BPA free and non-leaching Polypropylene with a nylon wrapped sleeve. The lid is a sealable sip-it lid that helps protect your beverage from dirt and keeps it warm for longer. The handle of this mug collapses for easier packing and storage. This mug weighs only 3.5 ounces and is perfect for the adventurers who are trying to save every ounce they can. 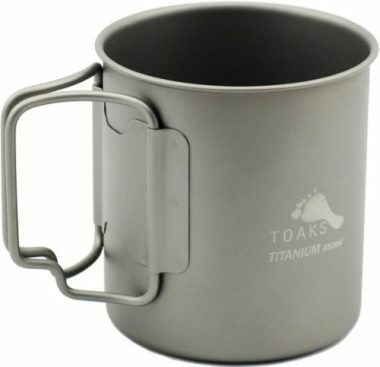 This Titanium Camping Cup by TOAKS is an ultra-lightweight no lid design that holds 450ml and is made of grade 1 and 2 titanium. The titanium of this camping cup does not have a coating and won’t leave a foul taste in your mouth. This cup can be easily nestled amongst your other camping kitchen gear and comes with a mesh carrying sack. There are two handles on this outdoor mug and both are collapsible for easy carrying. 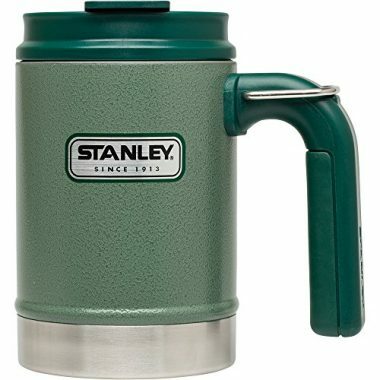 This Classic Vacuum Camp Mug by Stanley is made of 18/8 stainless steel that is rust free and naturally BPA free. 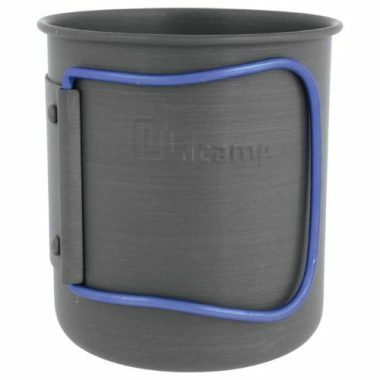 The vacuum insulation of this camping cup can keep your drink hot for 2.5 hours or cold for 4.5 hours. If you add ice, it can last up to 20 hours cold. This mug has an integrated D-ring that can be flipped up and down, so you can clip it to your pack. There is a leak resistant lid and it is dishwasher safe. To ensure you get the most out of their design, Stanley includes their Lifetime Warranty. 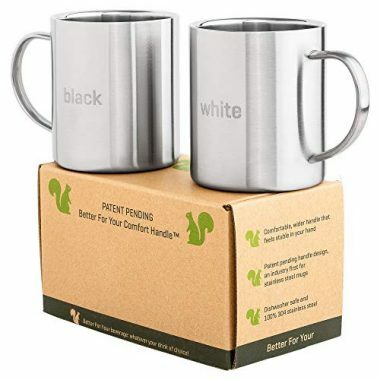 If you are looking for a set, these Stainless Steel Coffee Mugs by Better For Your have an unbreakable design that is ideal for your camping gear collection. These mugs can survive drops and falls because they’ll bounce off the floor, instead of breaking. The camping mugs have double wall insulation and are made of food grade stainless steel. Both mugs are engraved with one labeled as “black” and the other “white”. You can take these mugs anywhere from RVs to campers. This Space Saver Mug by Olicamp features a hard-anodized body that is durable and lightweight. This outdoor mug fits 1 quart. You can slip it on the outside of a Nalgene bottle or Kleen Kanteen bottle that is 40 ounces, for an easy pairing. This mug has a large collapsible handle that can be used to easily carry your camping mug. The no lid design makes this cup easy to drink from and a popular choice among campers for sipping their coffee at the campsite in the morning. When it comes to choosing which camping mug is the best to buy, you will have to decide which design and what features will best suit your needs. From the size to the style, there are elements to each camping mug design that can enhance your camping trip. The best camping mug will be durable to last throughout the years and consistently keep your beverages hot, so all you have to do is sip and enjoy. There are many different materials that camping mugs can be made out of. Some commonly used materials are silicone, stainless steel, titanium, plastic, ceramic, and glass. Each camping mug design will have pros and cons based on their materials. The best you can do is choose a material that is long-lasting and unbreakable. You are camping, after all, so an accidental drop shouldn’t shatter your camping mug. Silicone is a rare choice in a camping mug, but some may be drawn to its flexibility. Silicone mugs can be crammed into a pocket for an easy carry and shouldn’t leave any foul taste in your mouth. Metal is commonly used in camping mug designs, with the most popular choices being stainless steel and titanium. Stainless steel is a durable material that comes with a relatively affordable price. A high-quality stainless steel should not leave any metal taste in your mouth. Titanium is also very popular because it is extremely lightweight. For the backpackers, every ounce counts, so a titanium mug may be just the design they need. Plastic camping mugs are inexpensive and lightweight. The only downfall is that plastic will not insulate a drink as well as other materials and isn’t as long-lasting. Some users also state that plastic added a foul taste to their drinks. Plastic isn’t the best choice for a long-lasting camping mug, but it could serve well in emergencies. Ceramic and glass mugs are affordable and stylish. However, they lack in the durability department because they can be easily broken. 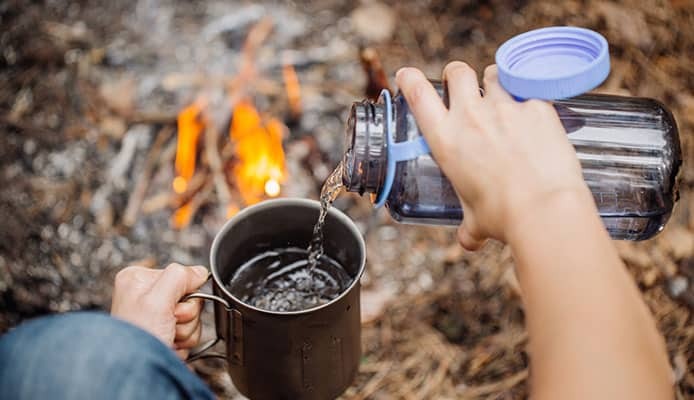 If you are camping on the trails and not just out of your car, ceramic or glass mugs are not recommended because they can be easily shattered. Camping mugs have built-in insulation to keep your drinks steaming hot or freezing cold. The most common type of insulation used is double wall. Double wall insulation adds two layers of material that surround your beverage. There are single walled mugs, but they aren’t as durable and have poor insulation. The best camping mug would have double insulated walls on top of vacuum insulation too. The vacuum minimizes the transfer of heat and helps keep your beverage insulated. For both campers and backpackers, the size and weight of their gear is an important aspect, because it controls what they pack and how they pack. The size and weight of your camping mug should always be considered because you don’t want to add excess weight to your pack. When choosing a camping mug, you should always ensure that you have the space to pack it and how you will carry it. The most common size for camping mugs is 20 ounces or smaller. Generally, this is a good size to keep you hydrated, without having to lug around a massive cup. However, if you want a larger size, there are 30- and 40-ounce camping mugs and some even reach 64 ounces. It is entirely up to you to decide which size best suits your needs. Just like the actual mug design, there are many different lid designs for camping mugs too. The lid can be an important feature because it gives your beverage protection against spills and can keep it hot or cold longer. You also want to be sure that the lid you choose is comfortable and easy to drink from. Lidless mugs are easy to drink from because there is not barrier. Some people may enjoy the feel of a lidless mug, but the drawback is that you aren’t protected against accidental spills. Lids with a tab are easy to use design that offers some protection against spills. The tab will most likely slide or twist to open and close. Flip lids offer the most protection against spills. Many flip lids are fairly spill proof and secure. This lid will have a piece of plastic that latches down over the drinking hole and is flipped up and out of the way to open. Some designs may not flip back far enough, which means they can bump into your nose when you take a drink. Other camping mugs will have their own unique lid design. Some lids have a button to push that opens and closes the lids, while other designs have a lid that has a built-in straw. With all the different designs, you should be able to find a lid that you enjoy using. Not all camping mugs are the same. There are different types of camping mugs that each have their own specific designs. The most common types of camping mugs are the tumbler, thermos or flask, and a mug. Tumblers are the most popular and versatile of all camping mug designs. Tumblers can be taller camping mugs that taper down at the bottom. Their shape is similar to that of a drinking glass. Tumblers do not have handles, which can make them an easy fit for cup holders. They aren’t fully spill-proof but offer enough protection against all of your beverage from spilling out. Tumblers are great at keeping hot drinks hot and cold drinks cold. Thermos or flask camping mugs are normally fully spill-proof. These types of mug put their priority in insulating your drink, over the ease of use. Thermos/flask camping mugs can keep your beverage hot or cold, all day long. Normally, these camping mugs are double wall insulated, which makes them a popular choice among campers. Mug style camping mugs are close in design to a classic ceramic drinking mug. The mugs tend to be shorter and broader, as well as have a built-in handle. The handle can be a great way to carry the mug comfortably, but it can hinder them from fitting into a cup holder. Some mug styles also have a lid, which can help prevent spills and further insulate beverages. Camping mugs should be constructed to be durable. If you are taking your camping mug to rugged terrain, it would be frustrating to have a design that fails in performance. You should choose a camping mug that can handle a variety of locations and still deliver high-performance. Many mugs are constructed to be durable, but the best camping mug will have insulation. Insulation is what will maintain the temperature of your beverage, no matter if it is hot or cold. You also want your camping mug to be constructed well enough that it can survive a few drops and tumbles. It would be a bummer to have a mug break on the first use, just because you accidentally knocked it off the table or dropped it on the trail. The best camping mugs can take a few drops, without it affecting their performance. Commonly, mugs are always thought to have handles. With camping mugs, the rules can get blurry and there are many handle free designs. Handles offer an easy way to carry and hold your mug, but they may not always be practical when it comes to hiking on trails. Most camping mugs that have handles aren’t too heavy or bulky, but a handle-free design may still be preferred. If a mug is insulated, a handle isn’t necessary. The insulation of the mug should protect your hand from a hot beverage, so you can confidently hold the camping mug without worrying about burning yourself. If a mug is not insulated, a mug is necessary to keep your hand protected against burns. Typically, designs today are handle-free. Most tumbler and thermos/flask designs do not have a handle and the only design with a handle is the originally mug style. However, some companies may offer and handle design that can be easily slipped on and off the tumbler or thermos/flask. This can be a great option for those who still want a handle, but not all of the time. With the added handle accessory, users can decide when they want to hold their camping mug by the handle or slip it into the cup holder. Q: What are the benefits of using an insulated camp mug? A: Camping mugs are great because they offer you a portable way to take your beverages on the trail or for the different types of camping. 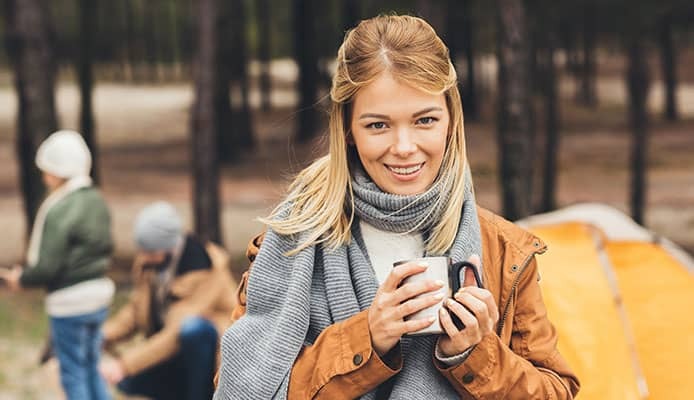 Camping tips are the same for festival camping or car camping, and if you are camping with kids or camping with a baby, it can boost your energy to have a cup of coffee in the morning. Insulated mugs are an excellent way to keep beverages hot or cold for longer times. This means that you can make a cup of coffee in the morning and go for a hike. While you are walking the trail, a great insulated mug will ensure that you are still sipping hot coffee as you go along. Insulated camping mugs are also design for rugged terrain. The best camping mug will be durable enough that you can take it on any outdoor adventure and last throughout multiple trips. As well, insulated camping mugs can prevent you from spilling all of your beverage. Camping mugs are also a great addition to your camping cookware sets. You can easily learn how to make coffee while camping by using camping stoves and camping utensils. Or you can easily invest in camping coffee makers. Your camping and backpacking food storage is also an important aspect and a camping mug can keep your drinks secure. The best is that camping mugs don’t always have to be used for just camping trips. The best camping mug can be used every day, as well as on the trail. No matter if you are going to the office or driving up the mountains, a great camping mug can be relied on for any excursion. Q: Will a travel mug take too much space in my luggage? A: No, but it can depend on the size of your mug. If you are looking to use your camping mug for travelling, you shouldn’t have any problems. Camping mugs are versatile and great for any trips that you want to take a beverage. It doesn’t matter if you’re out in nature or exploring a concrete jungle. Most camping mug designs can be easily added to any bag, without taking up too much space, but again this will depend on size. Generally, the most common size for people to choose is 20 ounces or smaller. Camping mugs these sizes are pretty standard and can be easily added to your travelling gear. However, there are mugs that are larger in size from 30 ounces up to 64 ounces. These mugs are quite larger than the standard size and you may find them difficult to travel with or you may find them easy to pack too. No matter, if you want to bring your camping mug travelling, you shouldn’t worry about the durability, because these mugs are built to last throughout any adventure. With these top rated camping mugs, you can greatly enhance your experience in the great outdoors and have you prepared for a winter camping trip. You can have peace of mind while you sip your beverage and focus on the beauty of nature. The best camping mugs will securely hold your beverage and keep them hot or cold for hours and will be easily integrated into your camping checklist. Camping mugs are durable and can be used for multiple excursions, throughout the years. If you know exactly what you need and want, you can save time and money by investing in the best camping mug! Do you own one the camping mugs that made it onto our list? Let us know how it has worked for your outdoor needs in the comments section below.